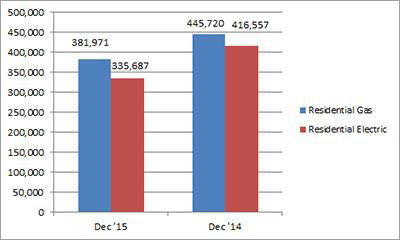 U.S. shipments of residential gas storage water heaters for December 2015 decreased 14.3 percent to 381,971 units, down from 445,720 units shipped in December 2014. 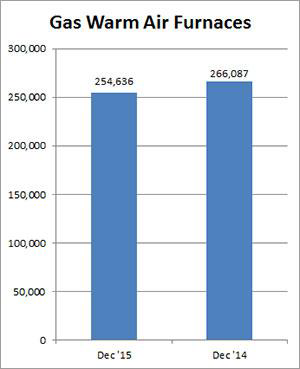 Residential electric storage water heater shipments decreased 19.4 percent in December 2015 to 335,687 units, down from 416,557 units shipped in December 2014. For the year-to-date, U.S. shipments of residential gas storage water heaters decreased 2.2 percent to 4,374,199, compared to 4,471,903 units shipped during the same period in 2014. Residential electric storage water heater shipments decreased 5.9 percent year-to-date to 4,027,067 units, compared to 4,227,329 units shipped during the same period in 2014. Commercial gas storage water heater shipments increased 14.4 percent in December 2015 to 9,305 units, up from 8,134 units shipped in December 2014. Commercial electric storage water heater shipments increased 36.8 percent in December 2015 to 8,576 units, up from 6,269 units shipped in December 2014. Year-to-date U.S. shipments of commercial gas storage water heaters increased 4.1 percent to 98,095 units, compared with 94,247 units shipped during the same period in 2014. Year-to-date commercial electric storage water heater shipments increased 20.1 percent to 88,251 units, up from 73,458 units shipped during the same period in 2014. 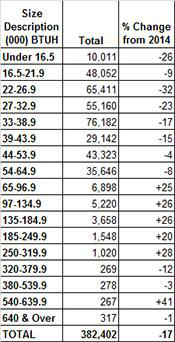 U.S. shipments of gas warm air furnaces for December 2015 decreased 4.3 percent to 254,636 units, down from 266,087 units shipped in December 2014. 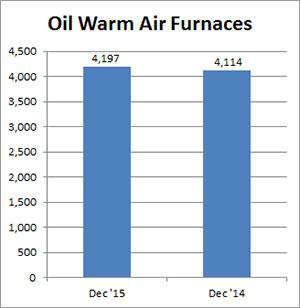 Oil warm air furnace shipments increased 2.0 percent to 4,197 units in December 2015, up from 4,114 units shipped in December 2014. Year-to-date U.S. shipments of gas warm air furnaces increased 2.9 percent to 2,814,203 units, compared with 2,734,713 units shipped during the same period in 2014. Year-to-date U.S. shipments of oil warm air furnaces increased 10.0 percent to 38,181, compared with 34,725 units shipped during the same period in 2014. U.S. shipments of central air conditioners and air-source heat pumps totaled 382,402 units in December 2015, down 17.2 percent from 461,835 units shipped in December 2014. 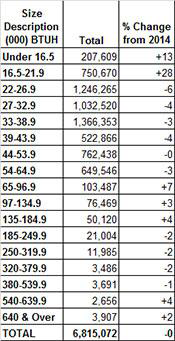 U.S. shipments of air conditioners decreased 11.9 percent to 245,322 units, down from 278,369 units shipped in December 2014. 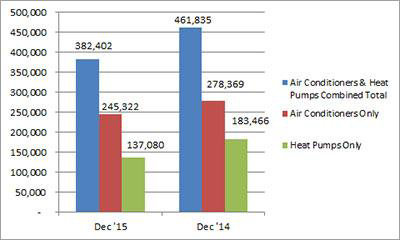 U.S. shipments of air-source heat pumps decreased 25.3 percent to 137,080 units, down from 183,466 units shipped in December 2014. 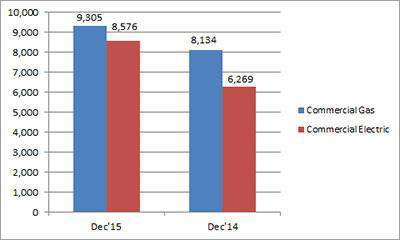 Year-to-date combined shipments of central air conditioners and air-source heat pumps decreased 0.6 percent to 6,815,072 units, down from 6,853,650 units shipped in December 2014. Year-to-date shipments of central air conditioners increased 1.0 percent to 4,545,876 units, up from 4,499,660 units shipped during the same period in 2014. The year-to-date total for heat pump shipments decreased 3.6 percent to 2,269,196 units, down from 2,353,990 units shipped during the same period in 2014.